Jordon said he was looking forward to "fresh challenges"
BBC news presenter Darren Jordon is to leave the corporation to join Arabic television station al-Jazeera. 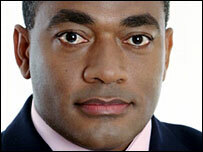 Jordon is to work on the station's forthcoming 24-hour English language news channel, al-Jazeera International. He said he had "learnt an awful lot and worked with some exceptionally talented individuals" at the BBC, but that it was the "right time" for a move. Head of television news, Peter Horrocks, said he was sorry to lose "an extremely accomplished news presenter". "Always straightforward in his reporting, and rigorous but fair in his questioning. We wish him all the best for the future," said Horrocks. Jordon is a regular presenter on all BBC One's main news bulletins. He has also presented BBC Breakfast, BBC News 24 and BBC World, as well as co-presenting major recent events including the D-Day 60th anniversary celebrations. The broadcaster joined BBC Sport in 1998, moving to Television News a year later. He had previously worked as a sports broadcaster in South Africa. Jordon was educated in the West Indies and at the Royal Military Academy, Sandhurst. He spent eight years in the Jamaican army before retiring his commission as a captain in 1986.